Center for High Tech Dentistry (New York) - Book Appointment Online! Good dentistry is more than our excellent clinical skills and state-of-the-art technology. Establishing relationships with our patients based upon trust and communication is our hallmark. Our highly skilled team is completely dedicated to treating you & your family with the finest quality care. In our warm and caring atmosphere, you can achieve the benefits of a happy and healthy smile that you will enjoy for a lifetime. 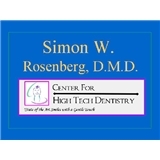 Dr. Simon W. Rosenberg and Staff p.s. fill out forms online.